This walk: 2011-5-25. Butterdon rifle range butts, 100 & 150 yards marker stones, Hangershell Rock, Hobajohn's Cross, cloudscape, the Lazarus stone (formerly recumbent longstone), Redlake railway track, green hairstreak butterfly, china clay pipeline inspection pit, Erme valley, Piles Gate, Sharp Tor, bluebells, heath spotted orchid, Pile Copse, Hanger Down Clump, hut circles, buttercup, Money Box, cist, May blossom. Another walk in this area: 28 April 2011, up to Redlake china clay works, at the end of the dismantled railway track.. There are some extra photos taken on repeating this walk on 27th May 2011. Observation Pit 2 (2C1) at SX 65462 60160. According to a Dave Brewer article in Dartmoor Magazine, no. 45, Winter 1996, pages 10-11: "Each of the four butts was assigned to a different regiment, No. 1 to the 2nd/12th, No. 2 to the 53rd, No. 3 to the 61st and No. 4 to the Royal Marines." Perhaps No. 1 was "2A1" and No. 4 was "2D1". Observation Pit 4 (2A1) at SX 65639 60255, with the old Harford Reservoir in the distance, surrounded by trees. 100 yards marker stone at SX 65541 60197, close to the observation pit for this firing lane. Note to self - never volunteer for observation pit duty on a rifle range! 150 yard marker at SX 65550 60149. There said to be 90 of these marker stones, approx. 8 x 5 inches, set flush with the ground. Taken as a cloudscape - is that a new word? Showing summer high cirrus and stratocirrus clouds. The Lazarus Stone - marked on the map as "Longstone (recumbent)" it is now upright again. Another view of the re-erected Longstone, next to a boundary marker between Harford and Ugborough parishes. A view of the dismantled "Puffing Billy" tramway up to Redlake china clay works: established 1911, closed 1931. Surveyed by RH Worth it is 7 ½ miles long and runs between Redlake clayworks (at 449m) and Cantrell (at 274m). it was used to take men and materials (coal for steam engine, iron and general supplies). The walk linked above - 28 April 2011 - followed this track to its termination at Redlake china clay works. A Green Hairstreak butterfly, Callophrys rubi. An inspection pit for the pipeline that brought china clay slurry from Redlake down to the Ivybridge area. Somewhere before the next photograph, there was a terminal blocking stone, at SX 65042 61114, that I forgot to photograph. It is at the western end of the "Stone rows" marked on the map, although the rows themselves were not easily visible in this area. 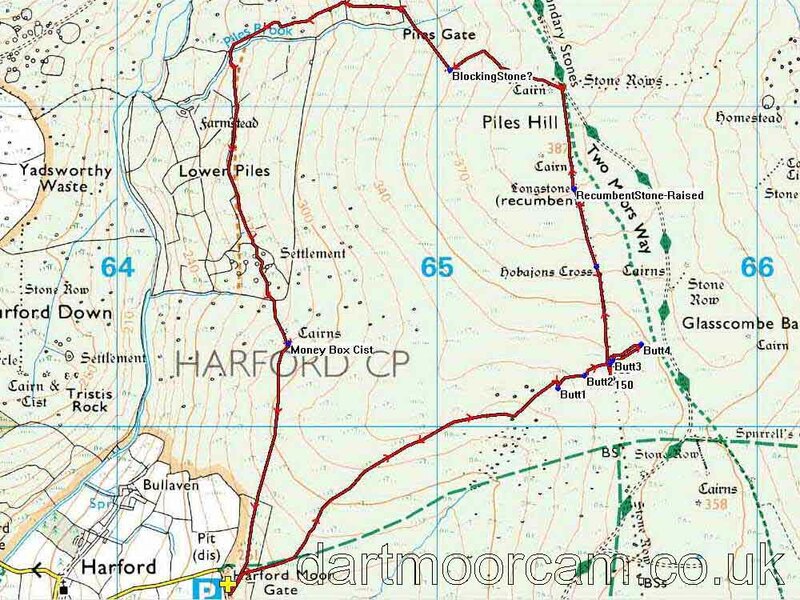 This may be the feature recorded at SX 6501 6110 (on the Prehistoric Monuments of Dartmoor web site) and described as "possibly a cursus". 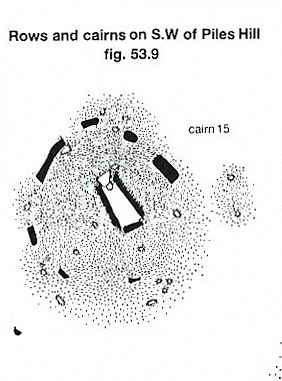 It is described as "Piles Hill double stone row and cairns (fig. 54.22)" in Dartmoor Atlas of Antiquities, Jeremy Butler, 1993, Vol. IV, page 63. It straddles the old railway track. Terminal blocking stone/s at the end of the double stone rows (which are almost invisible in this area), at SX 65042 61114. Looking north up to Sharp Tor. Looking across to a large area of bluebells ..... a sign of ancient woodlands? Zoomed view ..... Tristis Rock, Burford Down and Hall Plantation in the distance. Heath spotted orchid, Dactylorhiza maculata subspecies ericetorum. A Sphagnum moss ..... and that's as much as I can say about it! Another view up the Erme valley, this time showing Piles Copse, one of the three ancient oak woodlands on Dartmoor. Looking back at the bluebells. Sheep with twins before bluebells. Zoomed view to Hanger Down Clump. Hut circle / roundhouse ..... close to the camera, now filled with bluebells, where did they come from? Another roundhouse showing the door pillars. ©Jeremy Butler, Dartmoor Atlas of Antiquities, 1993, Vol. IV, fig. 53.9, p. 30. The Money Box kistvaen, this must be one of the deepest cists on the moor? Zoomed view to Harford church. Hawthorn tree in May blossom.